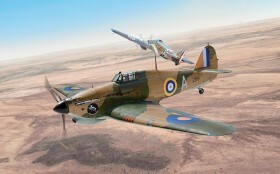 Hawker Hurricane Mk.I TROP - 1/48 - NOVIDADE! operational engagement during the Battle of Britain, however, was more robust, cheaper and easier to maintain and repair. On June 1940 the first Hurricane Mk I “Tropical” version, characterized by the adoption of the Vokes air filter, appeared. Several Hurricanes has been deployed in Malta and in North Africa.